Billing the project as an experiment in ‘slow TV’, Australia’s SBS television network ran The Ghan: Australia’s Greatest Train Journey for 17 hours straight last Sunday. While some described the programming as ‘like watching paint dry’, other fanatics couldn’t put down the remote. A 3-hour highlights package of the event garnered some 400,000 viewers, and the full 17-hour stream gathered intrepid viewers who treated it as a test of their own endurance. 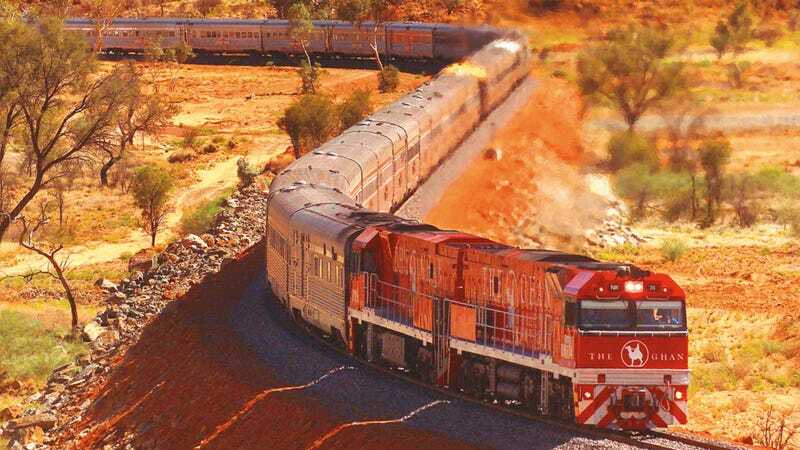 The Ghan is an Australian passenger train service operated by Great Southern Rail between Adelaide and Darwin, essentially the southernmost tip of Oz all the way up to the tippy top. The two cities are over 3000 kilometers apart, and making the trip by car would take some 33 hours of driving. If you can’t handle a plane, going by The Ghan seems like a pretty great option, if you don’t die of boredom. The rail passage operates weekly, taking 54 hours to travel the journey, including a four-hour stopover in Alice Springs. If you want to slow down and watch the 3-hour package, you can view it on-demand if you have an SBS login, right here. “No commercials, no stress; Just you and the tracks ahead”.